By Softmints on Dec 22, 2017. 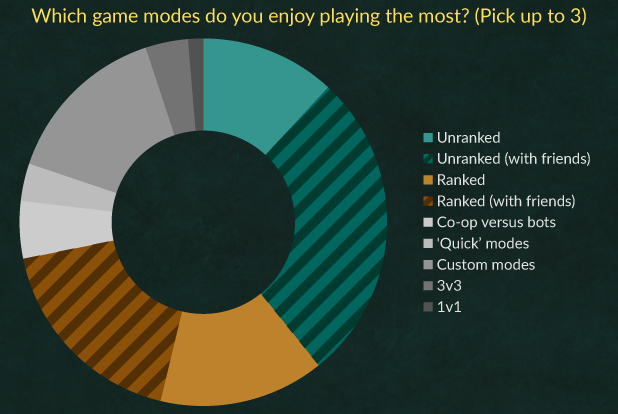 Last month, we put up a survey to get a glimpse of what was on people's minds when it comes to mobas. The link was shared largely among our immediate friends and people who are already interested in mobas, so this data has some obvious biases which must be taken into account. Just under 200 people took the time to complete the whole thing - not bad at all considering there were 40+ questions. I think we'll make future surveys more digestible. 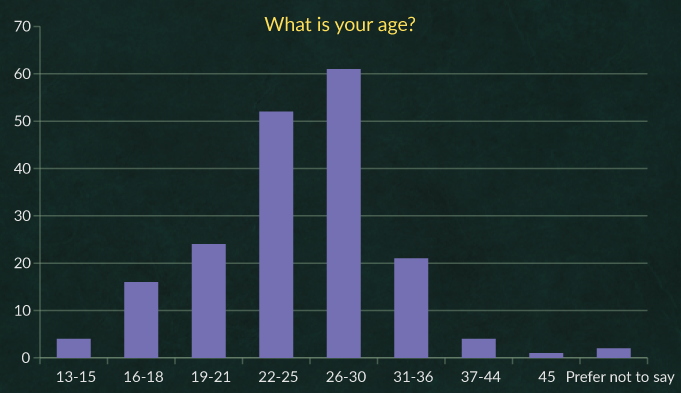 That matches up pretty well with our numbers for when people first started playing mobas: over 30% of our respondents started in 2003-2005. The answer I was hoping to see ("Being on a team where someone shot-calls and keeps up morale") came dead last! People don't seem to value that highly, at least not when they're answering surveys. One explanation is that other moments are more common themes in people's play, so it is easier to come up with those as answers. Another is that playing with friends captures the shot-calling and morale category for our respondents, who are generally an older demographic and have had time to solidify friendships. That showed up again in the game modes question. We knew unranked would be popular, but "with friends" (in stripes) was slightly more dominant. The significance of playing with friends was the most important survey insight. 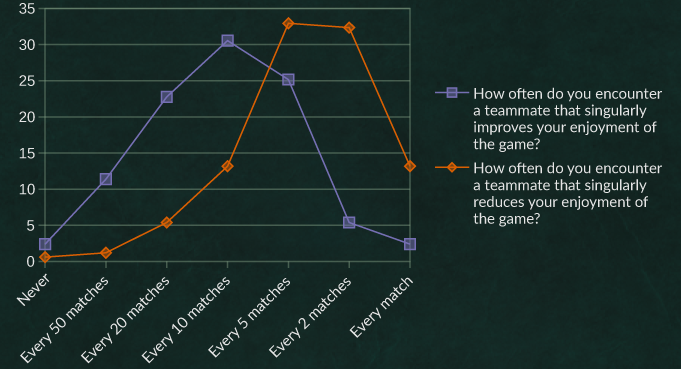 A lot of RoW's theory assumes solo-queue players as a baseline. We're reminded here that queuing as a group is common, and the game needs to ensure playing in and beside stacks is a positive experience. In the next chart, we see that most roles are equivalently popular, except "I like to provide the team's frontline damage", which gets only half the "Hell yeah! "s of other roles! I enjoyed how the distributions lined up so neatly. Getting close to two normal distributions suggests that this scale I experimented with ("every match" to "every 50 matches") is a useful one for helping people to express frequency. In any case, there is clearly work to be done in having positive teammates show up more often! For some final stats, 78% of respondents watch at least some esports, while 9% use linux for gaming. The average yearly spend is around $82 (or $22 if you eliminate the >$100/year spenders). Non-spenders made up only 26% of this survey's responses; these numbers probably wouldn't be so high for a more general audience. We had a lot of great thoughts from you in the "Write what you want to see in a new moba" field. Opinions certainly vary, but we are taking that feedback into account. Huge thanks to all who participated, and best wishes for the new year!